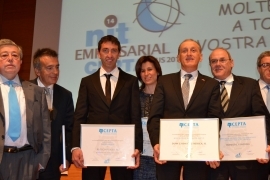 Entrepreneurship award at "14 nit empresarial CEPTA"
RS AsphaltPlus again in Burgos. Welcome to the RS Tecnologia’s website, a communication space that we hope will help you to understand our organization. Therefore we believe it is very important to know the main strategic axes that define us as a company. Mission: Design, create and market decorative asphalt paving, machinery and all kinds of tools for pavement processing. Vision: Bring to the whole world our 100 % recycled decorative asphalt pavement. 1. Sustainability : responsibility towards a sustainable future is the main value of this organization, chasing less use of raw materials and increased use of existing resources to achieve environmental balance. Promoting recycling . 2. Cooperation: working together with partners, employees and customers to achieve continuous improvement. Get beneficial and lasting partnerships . 3. Innovation : making technological development is the best way to achieve the vision of the company. 4. Integrity: do what is right even when no one is watching. 5. Commitment to People: people are the backbone of the organization. Promote the empowerment and encourage creativity. Assist in the reconciliation of work and family life.